The best cover artwork has a backstory about its creation, and in the case of the latest Pioneer Girl Project book, I have a personal connection. Once the Pioneer Girl Perspectives authors were on board, we had to consider what the book would physically look like. The first decision was obvious; we wanted another original watercolor from the artist Judy Thompson, who created Silver Lake Reflections for the cover of Pioneer Girl: The Annotated Autobiography. We asked her to follow the spring-like Silver Lake Reflections with a summer painting, and she suggested a haying scene. Though you can still find a few hay stacks in the Dakota countryside, by the time I was helping my dad in the late-1990s and early 2000s, a single person used a tractor to cut, rake, turn, and bail the hay rather than stack it. Technology also helped lessen common haystack problems like spontaneous combustion due to summer heat and moldy stacks from the inability to repel water during a storm. Camilla, Janet, Janice, and Doug Pflaum rake hay into a stack on their farm near Letcher, South Dakota, circa 1924. Photograph courtesy of Jennifer E. McIntyre. I am a third- or fourth-generation South Dakotan, depending on which ancestral line you follow. The prairie and lifestyle of Dakota also inform my own childhood experiences, even though I grew up over one hundred years after Wilder did. My maternal grandmother, Janice Pflaum, graces the monitor background of my work computer, making haystacks with her siblings in the mid-1920s. Much like today and in Wilder’s time on the farm, the whole family pitched in to get the work done. I shared the photograph with Thompson as she was researching positioning and other aspects of her painting, such as the long, thin-handled rakes. In addition to the photograph of my family, Thompson and I looked into hay stacking during Wilder’s time, ensuring accuracy in the figures’ clothing and the tools that would have been used. The final product is Summer Fields, a watercolor painting that shows Laura Ingalls as a young pre-teen raking the hay into a stack as her father, Charles Ingalls, loads more onto the wagon. Off in the distance viewers can see the Ingalls homestead. What a great image to introduce a book that studies Wilder’s life and work! “Don’t judge a book by its cover” is a phrase that librarians, parents, and others caution young readers with. I’ve always taken issue with that phrase because, for me, the cover is an introduction to what I will be reading, a reminder of the world I will be jumping into every time I turn a page. Thus, from my point of view, the cover is an important part of the reading process, and a degree of judgment seems only natural. A good cover draws readers into the story before they have even cracked the spine. The goal of the publisher is to create a cover that both attracts readers and provides a window into what the book contains. Some artistic license may be involved in conveying the essence of what readers can expect to experience. Even though there is a photograph of Laura Ingalls with her hair loose down her back, when we released the cover image for Pioneer Girl: The Annotated Autobiography, a “hair controversy” ensued. 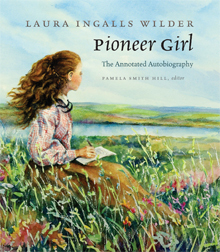 In general, some readers claimed, the real Laura Ingalls would have worn her hair up, but when I look at the artist’s rendition on the cover of Pioneer Girl: The Annotated Autobiography, I am immediately transported to the wind-swept West and the beginnings of an American writer’s journey. Deb Hosey White, in her blog on Goodreads, goes further: “If ever there was a book that felt special when I first held it in my hands and began turning the pages, this is the book.” The reader’s experience should begin from the moment they see and pick up the book, and that is what the Pioneer Girl Project production team aimed to do in creating this cover and the book it encloses. Based on the overwhelmingly positive comments and industry reviews, I would say they have succeeded. 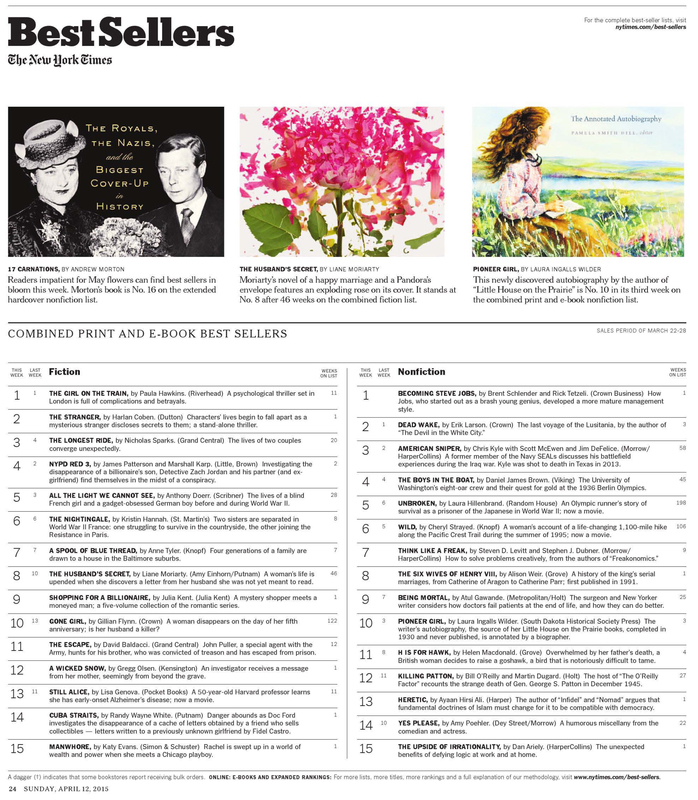 The New York Times Book Review even featured the cover along with their best sellers lists in the Sunday, April 12, print edition. Pioneer Girl: The Annotated Autobiography is a scholarly book (in fact, it has been called the encyclopedia on all things Wilder), but it is also the story of a woman’s childhood and adolescent experiences, and the watercolor painting by artist Judy Thompson illustrates this combination wonderfully well. Adorning the cover of Pioneer Girl: The Annotated Autobiography is a stunning watercolor by award-winning artist Judy Thompson. Made possible through a donation from De Smet Farm Mutual, Thompson’s Silver Lake Reflections captures a glimpse of Laura during her homestead years in Dakota Territory. In the painting, Wilder is depicted as a young person sitting in the lush prairie surrounding Silver Lake. This image is based on an early photograph of Laura Ingalls with her sisters, Carrie and Mary. Born and raised near Chicago, Illinois, Judy Thompson now lives in Orange City, Iowa. Predominantly self-taught, she has been selected twice as an artist-in-residence with the National Park System and is an approved teaching artist for the Nebraska Arts Council. The Iowa Arts Council awarded her a grant in 2012 that enabled her Homestead Series to tour the Midwest in celebration of the 150th anniversary of the Homestead Act. This year, one of her projects can be found in the South Dakota 2014: Artists Respond to the State’s 125th Anniversary exhibitat the Center for Western Studies in Sioux Falls, South Dakota. She teaches drawing and painting techniques and is a member of the National Art Education Association and South Dakotans for the Arts. When asked about her inspiration for the painting, Thompson said, “Like Laura, I have a love for the prairie. Its wide horizons, wild grasses, and endless skies provide a boundless landscape for an artist to grow in, explore, and create. 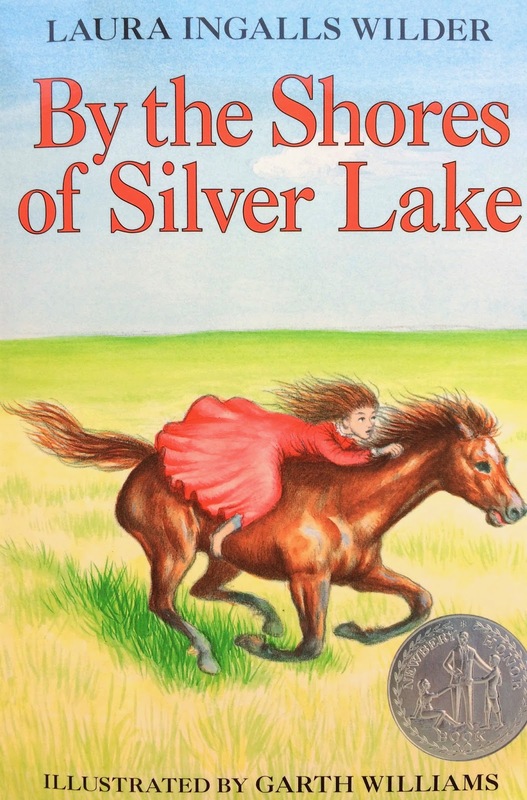 In Silver Lake Reflections, I wanted to portray Laura in her prairie setting as a young person who is inspired by the wild beauty which surrounds her Dakota home. The setting of the painting is taken from Wilder’s book By the Shores of Silver Lake, after Laura and her family have moved to Dakota Territory, where they eventually acquire a homestead claim.” Thompson emphasized that Wilder’s own descriptions of the landscape surrounding Silver Lake inspired the composition. “Laura is depicted as a teenage girl, feeling the prairie wind in her face while she sits by the shores of the lake with a newly built town suggested in the background” (back cover). To see more of Judy Thomson’s work, visit http://www.judythompsonwatercolors.com.